When you click on this link, the Internet Archive player will launch and begin playing the episode. It is my contention that few people start the hobby in 2-rail O Scale, but I believe that it is where increasing numbers of people will end up. With the current state of the art in HO, factory produced locomotives and rolling stock meet or beat what the best modeler can do. As Clark Kooning (Master Model Railroader and former director of the NMRA) admitted in response to my question on one episode of MRR, he not upgrading his Blackstone HOn3 locos on his current layout under construction because "they have everything". 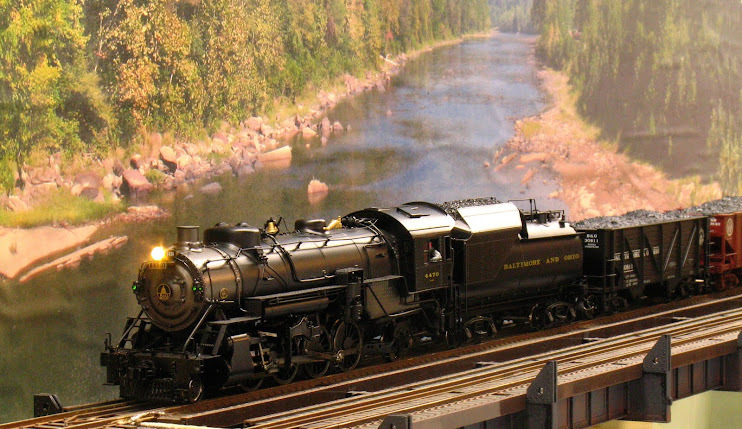 As factory HO models begin to routinely exceed the skills of a Master Model Railroader to improve upon them, what's a modeler to do? Come to O Scale. We have great kits and factory rolling stock that can be improved upon; not because the factory product is crude, but because so much more can be done in O Scale. Things like working brakes, coupling air hoses, operating steam reverse gear, highly detailed track work and, most importantly, it's all large enough to see with aging eyes. O Scale need not be expensive as the gap between HO and O is narrowing quickly (e.g. an HO car is $30-40 even $50 and an O Scale car from Atlas is about $60). Plus you need less O Scale to fill the available space. I'll get off of my soapbox and let you listen to the episode and decide for yourself.